A very good hunting round and at a steal of a deal. 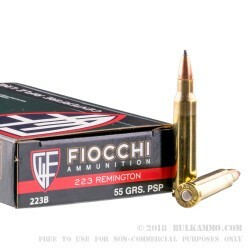 The Fiocchi PSP 55 grain load (Fiocchi model SKU 223B is a well balanced, good quality round that has a large array of use cases. 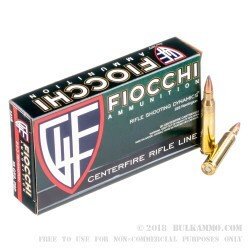 The accuracy is above average, the quality control is very good and the components are all made in house by Fiocchi. For the money, it’s hard to beat this round if you need something you can hunt bigger game with without costing you and arm and a leg. 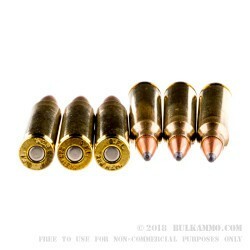 The moderate ballistics make this a great round for those who want to shoot it in different scenarios. The still impressive numbers that this round achieves, make it more than adequate for hunting, target shooting, scope work (out to 300 yards or so) and most of the self defense type uses that can be imagined. 3230 feet per second velocity and 1275 ft. lbs. of energy in a soft point can easily dispatch a deer sized animal. 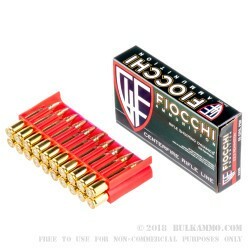 Where not governed by law to use all copper projectiles for big game, this is a suitable load for big game hunting and of course anything smaller. It is very good for moderately sized predator animals (coyotes) and varmint in general.